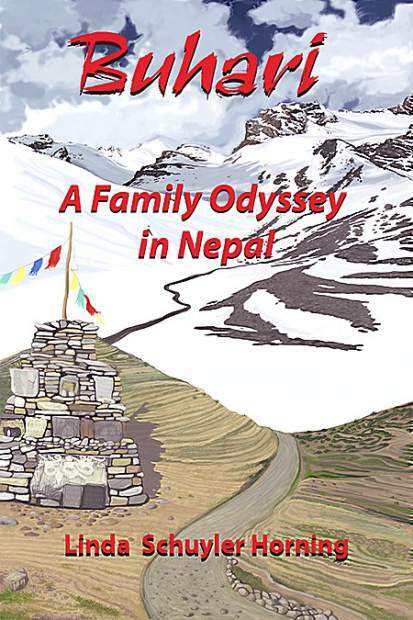 Linda Schuyler Horning is the author of âBuhari â A Family Odyssey in Nepal,â which tells the story of family relationships and foreign travels. WHERE: Madelyn Helling Library Community Meeting Room, 980 Helling Way, Nevada City. “Buhari” means daughter-in-law in Nepali, and the author wrote the book after visiting her son, eight-years a resident in Nepal, in 2014. Neil Horning had fallen in love with a Nepali woman, named Sonam, whom mom and dad had yet to meet. Mom’s own family ties lay 3,000 miles away in Pennsylvania, and she feared her adult son would lose touch with this family back in the States. In her book, Horning writes more about family relationships than foreign travel alone. She recognizes the heartbreaking loss as a mother when an adult child chooses to settle abroad. As luck would have it, just as Horning’s book was about to be published, she learned of her son’s plans to return to the states. Arriving shortly before the solar eclipse, Neil Horning was able to share this experience with his parents. Sadly, however, his wife, Sonam, was forced to stay behind. Her travel visa had not yet been approved. At an Aug. 26 read/sign/sell event at the Open Book, Horning read from her new book, then asked the audience to cross their fingers in hopes her daughter-in-law would have her visa granted. By month’s end, her wish was fulfilled. An ebook version of “Buhari” will be released a week following this event. Those who want a signed paperback copy are advised to purchase it ahead of time in Nevada City at Harmony Books; in Grass Valley at The Open Book or at The Book Seller; or in Auburn at Winston Smith Books. Horning, a Registered Dietitian Nutritionist and former diabetes educator wrote extensively within her career field. Those works included The Complete Idiot’s Guide to Fasting with Eve Adamson and a contribution to Beef Busters, by Marissa Cloutier, M.S., R.D. Horning’s love of writing extends back to her early years on a rural Pennsylvania farm, where she wrote stories about her family home and mother’s yellow kitchen. Now she writes about adventures she shares with husband, Phil, in the foothills and mountains of the Sierra.